At Ceramictec we install the finest selection of name brand ceramic tiles with the widest selection of patterns, textures, sizes and colors. No matter what your decor or color scheme we can help you find the perfect tile for your home decorating. Porcelain Tile — Is a tile that is generally made by the dust pressed method from porcelain clays which result in a tile that is dense, impervious, fine grained and smooth, with a sharply formed face. Porcelain tiles usually have a much lower water absorption rate (less than 0.5%) than non-porcelain tiles making them frost resistant or frost-proof. Glazed porcelain tiles are much harder and more wear and damage resistant than non-porcelain ceramic tiles, making them suitable for any application from light traffic to the heaviest residential and light commercial traffic. Full body/though body porcelain tiles carry the color and pattern through the entire thickness of the tile making them virtually impervious to wear and are suitable for any application from residential to the highest traffic commercial or industrial applications. Porcelain tiles are available in matte, unglazed or a high polished finish. Glazed Tile — Most of the common ceramic floor tiles have either a glazed, or unglazed surface. The glazed tiles have a special ceramic coating that is applied to the body of the tile and then fired under high heat. The glazing becomes hard. Unglazed Floor Tile — There is no glazing or any other coating applied to these tiles. Because these tiles are porous it is recommended that a special penetrating sealant be used to maintain this type of floors and to help prevent stains from seeping into the pores of the tiles. Their color is the same on the face of the tile as it is on the back resulting in very durable tiles that do not show the effects of heavy traffic. Marble — Marble is a natural product and is not made in a factory. For this reason no two pieces of marble look the same and the veining is a natural characteristic in all marble. One of the more popular marble tile in Florida is Travertine. There are special marble sealants to help protect from staining of the face. Extra care should be used when cleaning and all abrasives and acidic cleaners should never be used when cleaning. Even colas, some juices, and possibly ammonia may destroy the marble finish. Granite — This is another natural stone and is not manufactured in a factory. Granite can be used indoors or outdoors and is less porous than marble. It is still recommended that you use a sealant to protect the finish from staining. Grout — Grout is a mixture of cement and a color additive. For tile floors with wider spaces between each tile sand is added to the grout. Also, a liquid latex additive can be added to the grout to give better resiliency to the grouted areas. For ease of maintenance a penetrating sealant should be used on the grout. 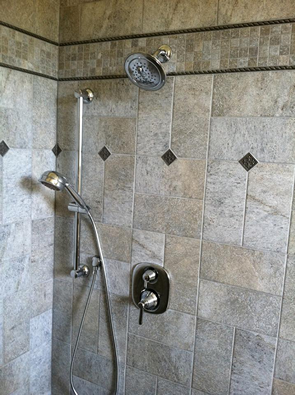 It should be noted you may see a change in color of your grout over time. To stop this we highly recommend an upgrade to an epoxy grout.